Thirteen hours, 10 minutes and 58 seconds of glorious daylight today. Tomorrow it will be thirteen hours, 17 minutes and 43 seconds. Each day we gain just seconds shy of seven minutes, as March rolls into April and April rolls in May. On June 21st our area will celebrate the Solstice and 21 hours, 49 minutes and 32 seconds of daylight. Fairbanks residents know how to live it up on this special day with a huge street festival. There will be games, music, vendors, food and the Midnight Sun Run – a 10 K race that starts at 10 p.m. and attracts runners from all over North America. Proceeds from the race benefit Interior Alaskans living with disabilities. Many people head up to Eagle Summit, 108 miles from Fairbanks and at an elevation of 3,624 feet. 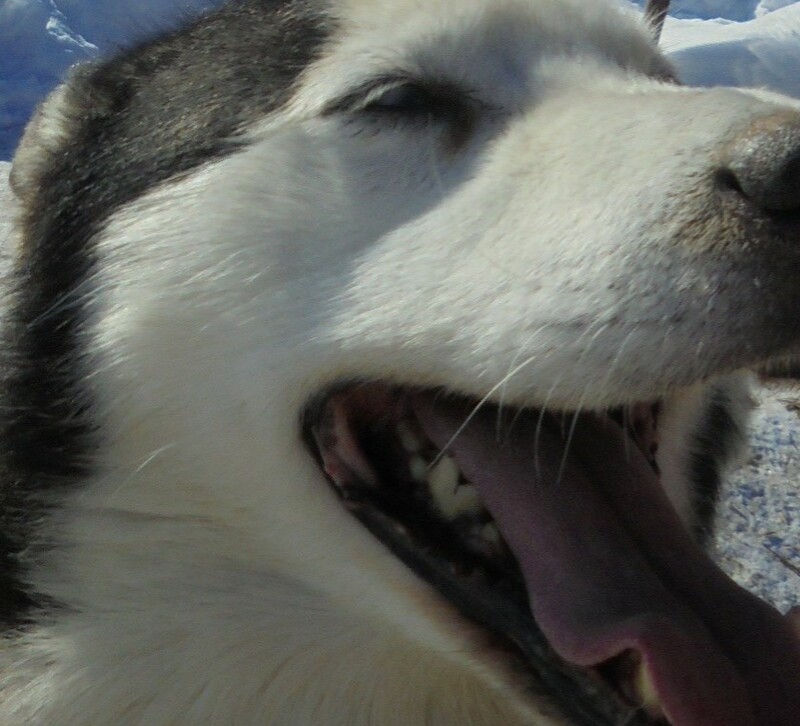 This summit is one of the toughest for mushers on the 1,000 mile Yukon Quest dogsled race. 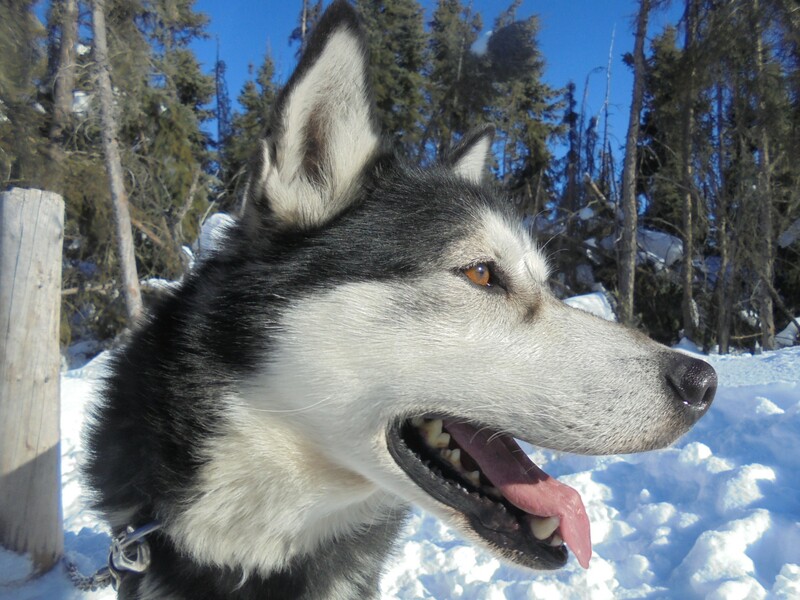 Mushers have experienced broken bones, stalled teams and been plucked off the top, with their dogs, by military choppers in ferocious storms. The road to the summit can be just as challenging, even in summer, with sudden and unexpected blizzards. If the skies are clear, solstice celebrants will watch the sun circle them and never dip below the horizon. But, I am getting ahead of myself. There are still 85 days until Solstice and plenty of glorious sunshine to enjoy. Spring and fall are my favorite seasons because both promise different adventures. I cherish hours spent sitting on dog houses and just simply loving on the dogs. 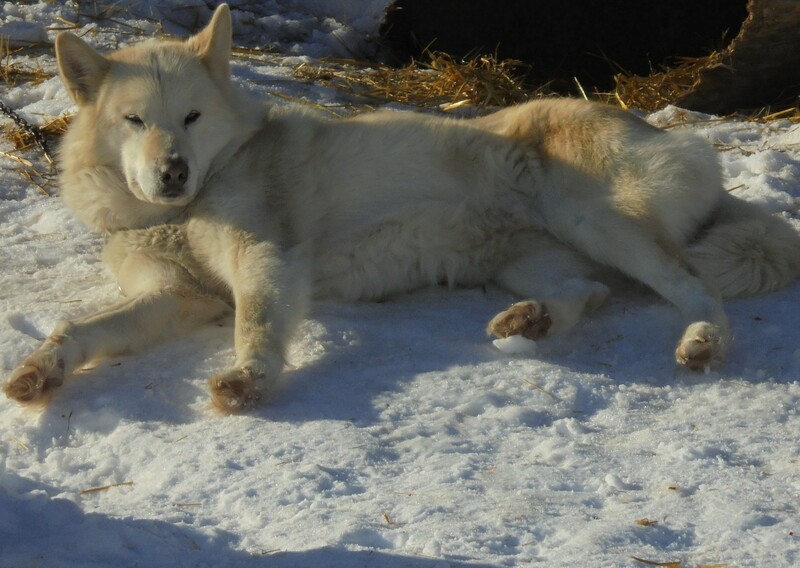 The warmth of our Alaskan sun feels so good on old muscles and bones – mine and the dogs! Blue is one of our young dogs. She was spayed last week and has made a speedy recovery. Our biggest struggle was keeping her quiet for a few days after surgery…..and from eating the cone of shame. We failed on both accounts! Does she look the least bit sorry for her crazy behavior?? The spring seems to be especially healing. This winter five of our beloved old timers died and our hearts have been weary. Nodd. PeePee. Bart. Glacier. Oni. All great dogs who had lived so many adventures with us. This warming and new season seems to whisper promises of better days ahead. 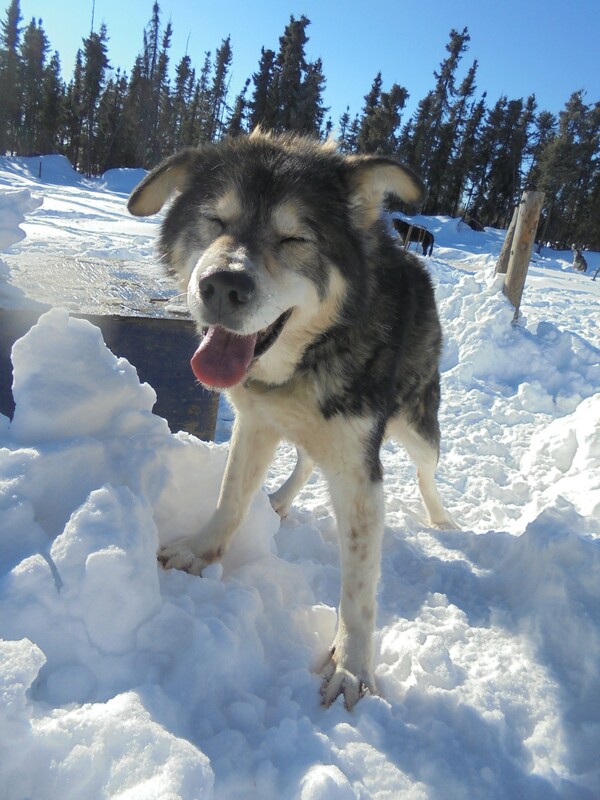 Lucy is a Greenland Eskimo Dog/Malamute cross. She is 11-years-old and her favorite spring time activity is napping in the sun. She was less than impressed that I called her name to wake her up. She is a very tough dog and no matter the weather, will sleep on the ground, even though a straw-filled house is just inches away. She’ll also kick away straw I put on the ground for her. Tyson, was born on Christmas Eve, 2004. His mom was small and his dad pretty big. He definitely takes after his dad! His nickname is Buckaroo, because of his penchant to buck like a little horse when he is happy. 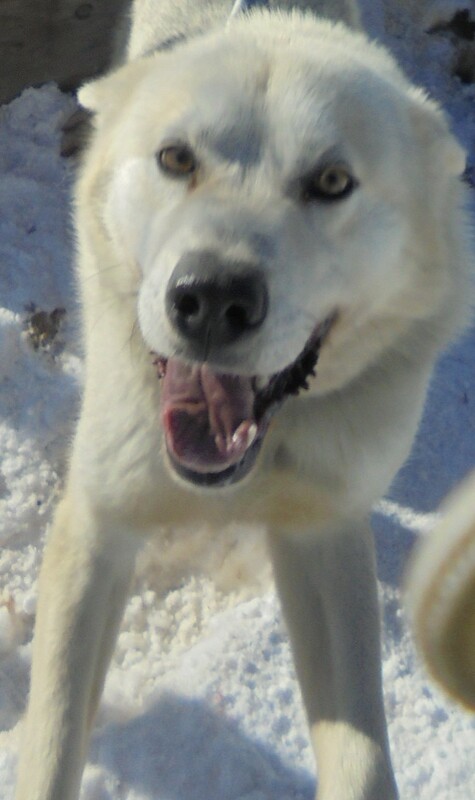 I told him a joke before snapping this photo…..he thinks I am hilarious! Introducing Scoot, aka Scoot the Toot, because…..well, he farted a lot when he was young! It’s hard to believe this handsome devil is 13! I put him in lead when he was barely a yearling and he was a natural. Old dogs are important to a kennel because they help young ones learn. 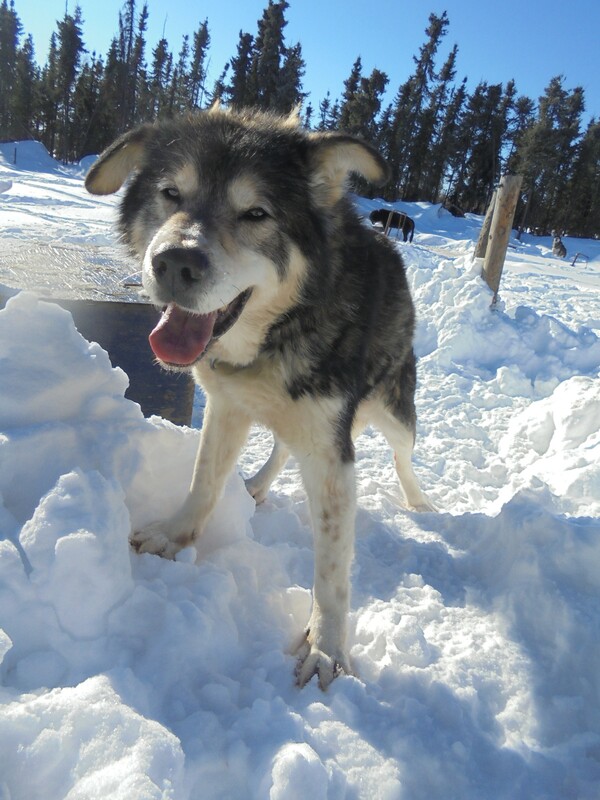 Blackie was born during a cold snap in November 2008 – like 50 below cold. He, his siblings and his mama, moved into our heated shed. Blackie spent most of this winter working for friends and he was very popular with the many guests. He came home a few days ago fit as a fiddle. Who wouldn’t want to hang out with dogs in this beautiful weather? The temperatures have been in the high 20s, to low 30s, and I’ve been kept busy shoveling out spots to keep moving dogs around. Switching them from spot to spot every few days, is like moving to a new neighborhood! I love hearing about your dogs and your home. I’m so glad you are feeling up to writing! Hi Cayla! Thank you, I really appreciate that. I hope you are well!